There will never be a “cure” brought to market because there just isn’t enough profit in eradicating the disease entirely. There will never be a governing body that protects consumers from being subjected to known carcinogens, because that, too, will stop the cash from rolling in. A great deal of research is covered up and many potential cures are ignored and discredited because there is far more money in perpetuating illness than in curing it. In 2012, the reported spending on cancer treatment was 124.6 billion dollars. 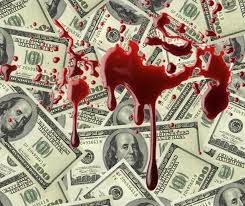 Blood money.